What do you do if Bingo suddenly collapses to the ground during your usual strolls in the dog park? Calling your vet may be a long shot given how long it will take them to arrive. What you need to know is how to perform CPR on dogs as Bingo’s life may depend on it. Despite how frightened you are for your dog, it is important that you stay calm in the situation. 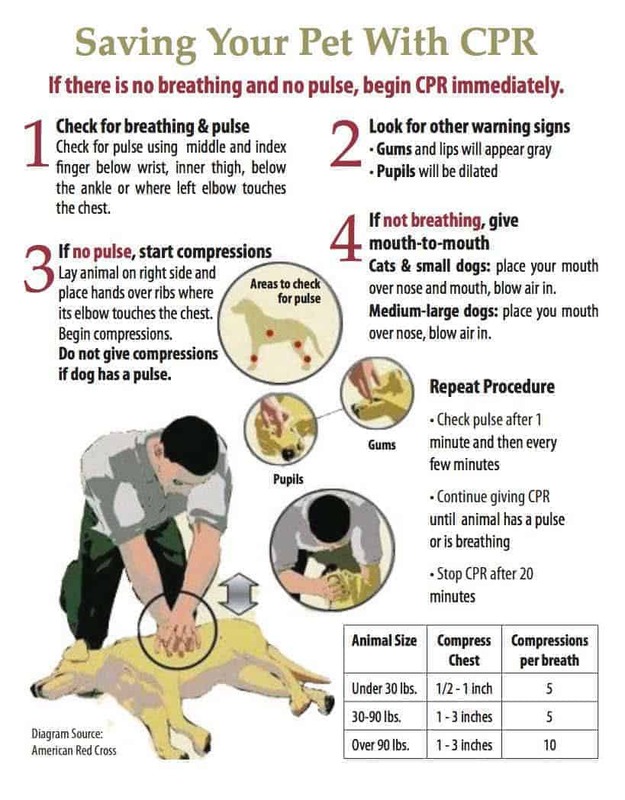 Follow the procedure below to successfully perform CPR on your dog. 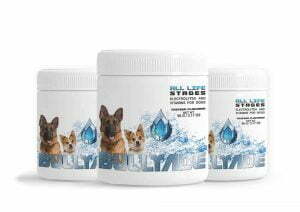 Place your dog on a flat surface, on his right side, ensuring his body is lying straight from muzzle to tail. This helps create a clear passage of air when performing CPR on dogs. Next, check if he has a pulse or is breathing through his nose. To check for breathing, hold the back of your hand against his muzzle. If warm air is coming out, he is breathing. If not, you should then check for a pulse. Using your fingers, trace along the inner thigh of his left hind leg where the femoral artery is located. This is the best part to locate a pulse in canines. Alternatively, feel around his metacarpal pad for a pulse. The metacarpal is the soft underside of his paw just below the front claws. If your dog has a pulse but not breathing, you need to perform artificial breathing on him. On the other hand, if he does not have a pulse, it means he is not getting any air at all. This will be the best time to jump-start his heart with CPR for canines. For this procedure, hold your dog’s muzzle with both palms like you are creating a tunnel to blow air through. This is where it gets tough as you have to be comfortable with doggy breath. With the head held firmly with both hands, beginning blowing air through the nostrils into his body. While at it, also check that there is nothing blocking his nostrils and preventing him from breathing. Also, pull his tongue forward and feel through his mouth if there is anything blocking his throat. If there is liquid, drain it out to clear his air passage. Chest compressions combined with artificial breathing is the foundation of CPR for canines. The ratio of breathing to chest compression is 5 compressions for every breath blown into his nostrils. How much pressure you apply on his chest depends on the size of the dog. If you own a toy breed like a poodle, you have to press gently on the dog’s rib cage using your fingers. Press gently in 5 compressions followed by artificial breaths. 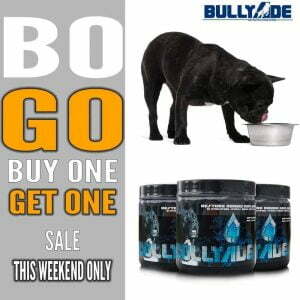 For large dogs like the Bullmastiff, you have to press harder on the dog’s rib cage with both hands. Place one palm on top of the other and press firmly on his rib cage in five compressions then breath into his nostrils. If your dog comes around from the emergency CPR, you did a good job. Ensure you rush him to the vet immediately to find out what caused the blacking out. However, if he is not responding from the CPR, remain calm and continue the procedure. It helps him keep breathing until professional help arrives. 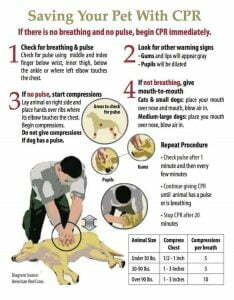 CPR for dogs is an important skill especially if you have pets at home. It is also a handy skill you can perform on a stranger’s or neighbor’s dog and save the dog’s life. 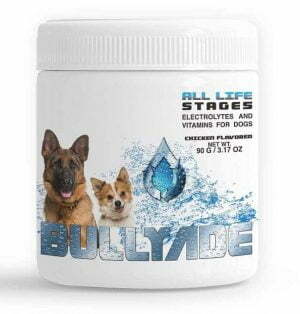 Bullyade helps with redblood cell development and can save a dogs life during times they pass out from heat exhaustion or heat stroke.